3D Platform (3DP) is a leading global manufacturer of large-format, industrial-strength 3D printers. 3DP’s line of WorkSeries machines offer game-changing throughputs that will get you more out of your additive workflows and allow you to print larger parts at faster rates. Based in Roscoe, Illinois, USA, 3D Platform is a company of skilled mechatronics engineers who embrace rapid advances in technology to innovate, design and build next generation equipment for additive manufacturing. 3DP is committed to building on industrial strength linear motion components, actuators and motors while maintaining affordable flexibility with open-source software and control solutions. 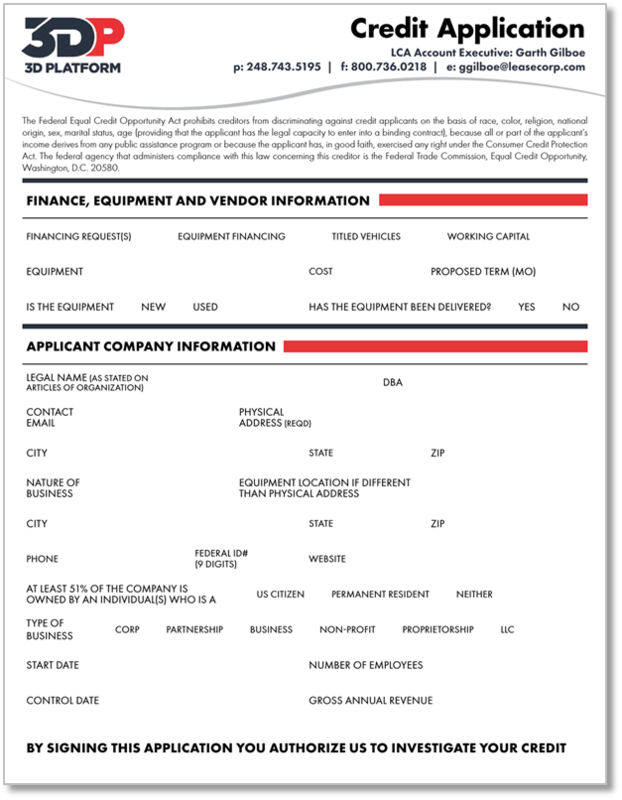 Financing equipment allows businesses to get the equipment they need without affecting bank or credit lines. No matter the type of business, you need the proper equipment to efficiently compete and flourish. That’s why Lease Corporation of America provides financing options for 3D Platform: so your business can reach its full potential.